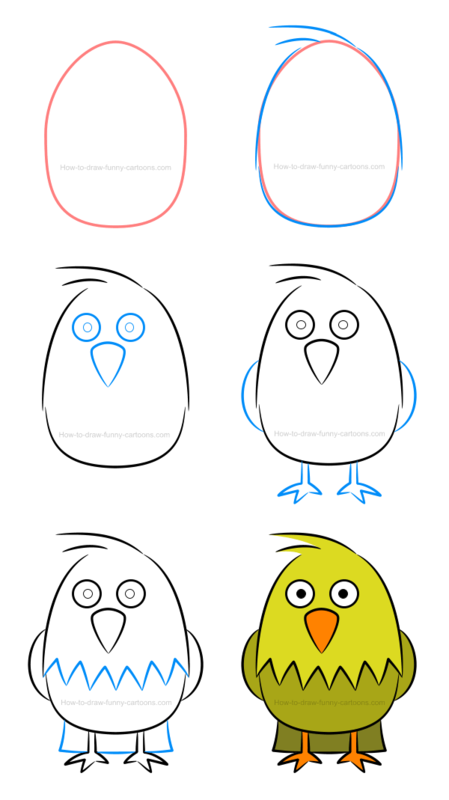 Learn how to create an illustration of a chicken and see how adding simple shadows inside the character can change the whole illustration! 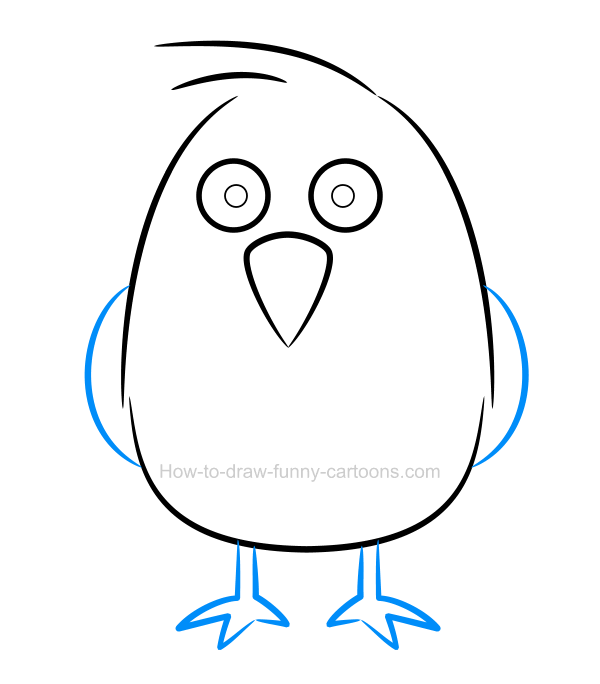 In this tutorial, you will learn how to draw this simple bird using mostly basic lines, shapes and plain colors. Then, once the character is completed, you will learn how to enhance this one using simple digital effects to create depth and volume. Of course, these basic effects can also be added using simple pencils or markers if you don't have access to a vector application. Before proceeding with this tutorial, it might be a good idea to take a good look at the character to see what makes it so special. Let's use the illustration above to study this cute cartoon chicken! On top of the head, some hair is visible. The eyes are made from small circular shapes. The beak is made from a large triangle and filled with an orange color. Both wings are simply made from a long curved line. The legs and feet are short and done from triangles. The tail is large and slightly darker. The body is round and large. Some hair can be seen just below the neck of the bird. The head is made from a simple oval shape. First, let's draw a simple shape so that we can use it to draw the character. This shape must be similar to the one of an egg. Make it pointed on top and very large on the bottom. This is just a template that you will need to erase once the next step is completed. 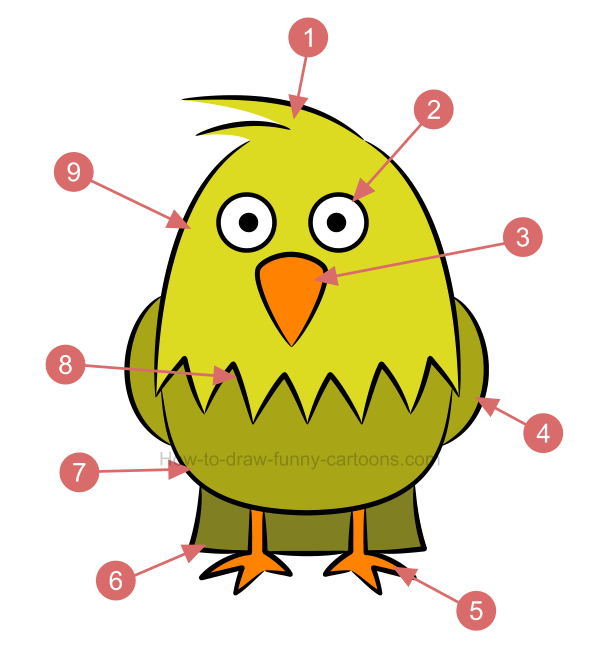 Using only curved lines featuring pointed ends, draw the body and head of the animal as shown in the image below. Make sure that the hair on top is clearly visible using two additional lines. 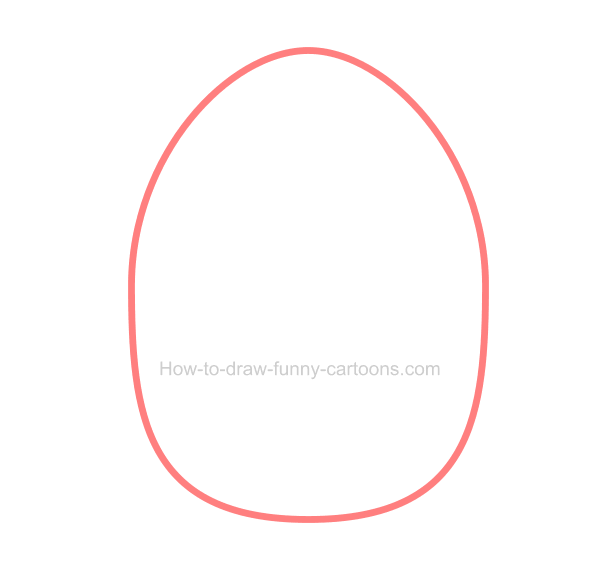 You can now erase the large oval shape drawn earlier since this one is not needed anymore. Drawn the eyes using two medium circular shapes. Then, add pupils inside these eyes using small dots. 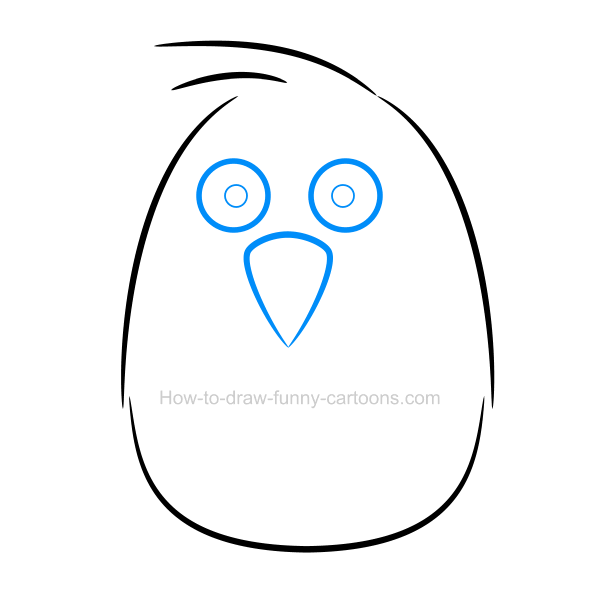 Continue working on this illustration of a chicken by sketching the beak using a large triangle made from a single curved line. 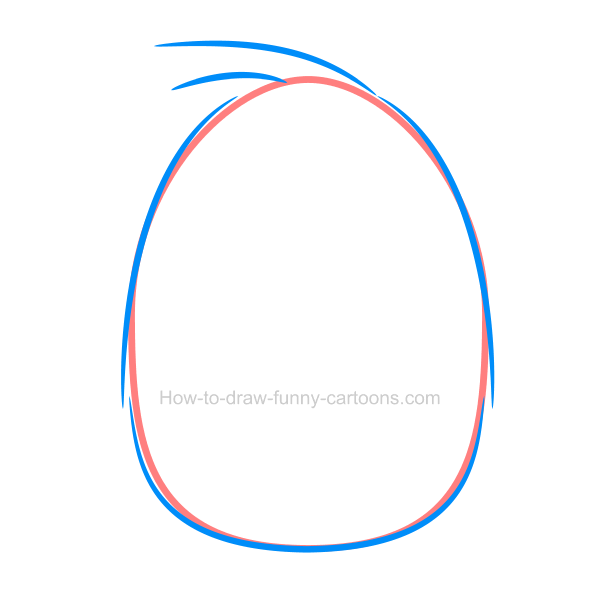 On both sides of the cartoon chicken, draw the wings using long curved lines. On the bottom of the body, create the legs of the animal using mostly straight lines. Fingers are made from large triangles. Excellent! We are almost done for this part of the tutorial. Step 5 - Some hair and a tail to complete this character! The head and the body were created using the same shape, but it could be nice if we could separate these body parts. Inside this illustration of a chicken, draw some broken lines to create hair. Then, draw a large tail on the bottom of the character (behind the legs) to form the tail. 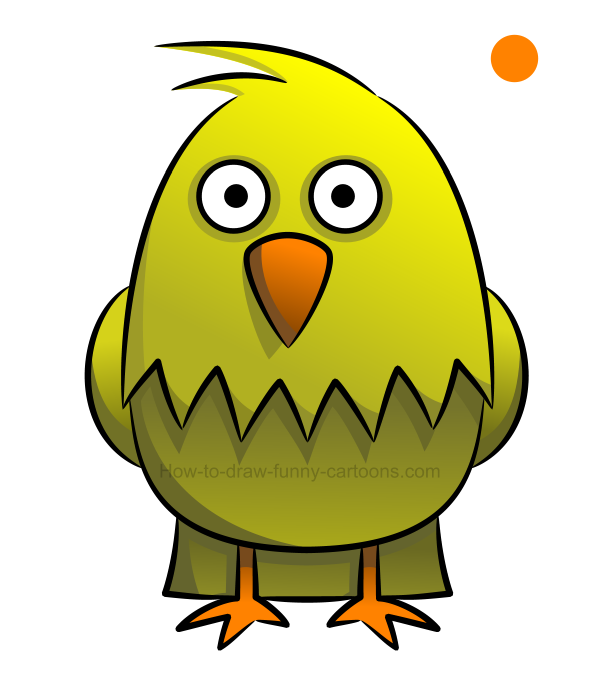 This cartoon chicken is mostly filled with a bright yellow color for the head, the body, the wings and the tail as well as a simple orange one for the legs and the beak. The eyes are white and the pupils are black. Make sure that the head is brighter while the tail can be much darker. adding depth and shadows to our little chicken friend! So far we have drawn a beautiful chicken using only a few basic lines and colors. The character is simple to duplicate and visually appealing. How can we make this illustration even more enjoyable? How can we add volume using just a few basic techniques without making this picture too complex or difficult to achieved? If you are working with a vector application, the first thing you can do to add volume to the character is apply gradient fills on all shapes. For example, you can see that the beak is filled with a bright color on top and a darker one on the bottom. It's a simple tip that can be quite effective. Let's go back to the original drawing (the one without gradient fills) and let's see how it could look like once a few shadows are added using new shapes filled with darker colors. 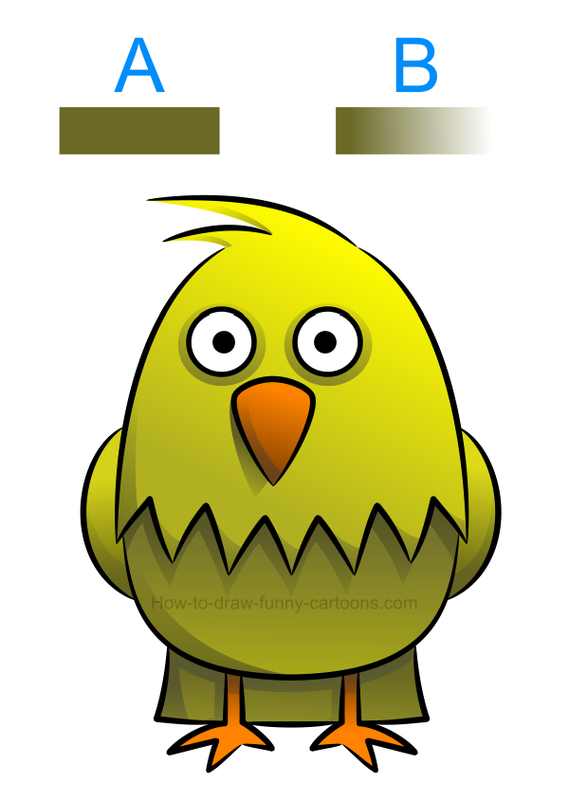 See how the bottom of the beak, the hair below the head or the shapes found near the tail are adding depth to this illustration of a chicken? Keeping all shadows created in the previous step, I have modified the colors to make these new additions a little bit darker. The effect seems dramatic and somehow, I almost feel like I am in the middle of an horror movie. Don't you think? Don't hesitate to try and mix different techniques! Adding depth and volume can be done using various techniques that can easily be mixed with each other. Simply select a constant light source (n this case it was the orange dot found above the character) and add digital effect until you are 100% satisfied with the results. Be careful not to add too many shadows or gradient fills inside the illustration. Simplicity is always a better option. Once you are comfortable with these techniques, making a character more realistic will be an easy task for sure!